Thank you visiting my blog! I'm a Sailor, Father, Blogger, Traveler and Runner who likes to run ultra marathons and adventures. I blog about the running I do and where it takes me, whether it's a small race or a big adventure run/ultra marathon. Running is my Savior and blogging allows me to share my experiences. I've always been a keen sportsman playing up until colt ages at Redruth RFC, surfing, golf and mainly Judo for almost 30 years where I became a 1st Dan as well as a Coach at club and County level. I was never a keen runner in the past, however that all changed in 2008 after I was entered by my brothers into a charity event. A 7 Mile Commando Challenge which practically killed me. I fell out of love for exercise from about 2003 apart Judo (although didn't really do exercise as such as I taught more than I trained) and became very very fat. At breaking the scales at over 18 stone it was then I decided I had to do something about it. I vowed to do the event again in 2009 but to run it all and not stop unless I really had to (queues for the obstacles). I started training for it 3 times a week and started to lose a little weight. The event came round and I did exactly what I trained to do. The same day I found out I had a place in the London Marathon in 2010. That was it, if I was going to run the London Marathon I would do it properly and so I did 6 times a week following a programme. In April 2010 I crossed the finish line of the London Marathon despite having injuries and became a marathon runner. I have not looked back since! I've raised 1000's of pounds for various charities as well along the of my running journey but I have never got place for an event through a charity it has always been off my own back. 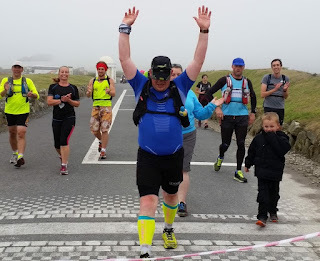 Since then I have gone on to run ultra marathons and in August 2015 I became the first (documented) person to run from the New Forest to Land's End via the route I ran. In Aug 2017 I attempted to run from North Wales to South Wales via Offa's Dyke path and Glyndwr's Way. Although I didn't manage to run it in it's entirety for a few reasons, I still ran from North Wales to South Wales starting in Prestatyn and finishing in Chepstow. I'm currently a member of Plymouth Musketeers Running Club, Mudcrew Running Club and I also when I can run with the Plymouth Coastal Runners. I've made some good friends in the running community but have made some great friends through ultra running community. I am very lucky to be supported by Tailwind Nutrition UK and I'm also I am now an Uglow Sports Ambassador, to which I feel very privileged to have their support. I will continue to tick the miles off as I go along and keep finishing as many events as I can.